Mentally ill people are labeled as “different” from other people and are viewed negatively by others. Many studies have demonstrated that persons labeled as mentally ill are perceived with more negative attributes and are more likely to be rejected regardless of their behavior. Better knowledge is often reported to result in improved attitudes toward people with mental illness and a belief that mental illnesses are treatable can encourage early treatment seeking and promote better outcomes. General public's view about mental illness remains largely unfavorable. Many members of the public in developing as well as developed countries cannot correctly recognize mental disorders and do not understand the meaning of psychiatric terms. Beliefs about causes may alter patterns of help-seeking and response to treatment. Patients with mental illness have been stigmatized since long back in any community, and this stigmatization is beyond just “labeling” the patients. The condition is perceived as frightening, shameful, imaginary, feigned, and incurable, while the patients are characterized as dangerous, unpredictable, untrustworthy, unstable, lazy, weak, worthless, and/or helpless in the community.,, Research has established that mental illness is more stigmatizing than physical illnesses., More stigmatizing attitudes are directed toward people diagnosed with schizophrenia compared with depression and eating disorders. Persons with mental disorders must not only cope with the psychological, cognitive, and biological symptoms of their psychiatric condition but also with many negative consequences that go along with highly prevalent stigma. There are many studies which have looked at the attitudes toward mental illness among urban, educated populations such as school students, youth, and nursing students., Very few studies have looked at the attitudes towards mental illness among rural populations. Hence, this study was taken up to explore the attitudes of the rural population toward mental illness. To assess the sociodemographic correlates with the perceptions of the public toward mental illness. The present study is a descriptive cross-sectional study, conducted in Sri RL Jalappa hospital and research center, Tamaka, Kolar. The relatives of all general patients who visited the hospital served as the study population. Three hundred consecutive individuals fulfilling the inclusion criteria were chosen for the study. The study was conducted over a period of 3 years from September 2014 to 2017. The participants were interviewed using the public perceptions of mental illness questionnaire after obtaining a written informed consent, and ethical clearance was obtained from the Institute's Ethical Committee. Relatives identified as the primary caregivers of the patients. Relatives of patients showing symptoms of mental illness and relatives themselves showing symptoms of mental illness were excluded. Those who refused to give informed consent. Data were analyzed using the IBM SPSS Statistics V22.0 (IBM United States). Statistical analysis was performed using descriptive statistics (i.e., mean, frequency, percentage, and standard deviation) were used. Level of significance was set as P < 0.05. Purposive sampling method was employed. Public perceptions of mental illness questionnaire The attitude of the public toward mental illness was assessed using the public perceptions of mental illness questionnaire. It has sections on the previous contact with people having mental illness, the etiology of mental illness, knowledge of people with mental illness, and care and management of the mentally ill. Answers were recorded using a 5 point scale (agree, somewhat agree, neutral, somewhat disagree, and disagree). [Table 1] shows the sociodemographic details of the participants. Out of the 300 participants, 46% were male and 53% were female. Majority belonged to the age group of 18–39 years. About 73% of them were married. Most of the participants were from a rural background (77%). Forty-one percent of those interviewed belonged to the lower socioeconomic status and 31% were educated to an intermediate level. Eighty-five percent were Hindu by religion. Twenty-two percent of them had a family history of physical illness and 8% had a family history of substance abuse. Only 33 (11%) had a family history of mental illness. Among the respondents, a vast majority (86%) had no previous contact with a mentally ill person. [Table 2] shows the participants view the causes of mental illness. A vast majority (39%) of the participants agreed with the statement that mental illness is caused by brain disease. One-fifth were of the opinion that mental illness is a result of genetic inheritance. Around 27% thought that mental illness is caused by substance abuse. On the other hand, 25% believed that mental illness is caused by bad things happening to you and one fifth said mental illness was God's punishment. Another one-fourth of the participants thought that mental illness is due to personal weakness. Data regarding the knowledge the participants had about people with mental illness is shown in [Table 3]. Almost half of them agreed with the statement that anyone can suffer from a mental illness. Twenty-two percent thought that people with mental health problems are largely to blame for their own condition and one-third felt that someone with a mental illness was usually dangerous. One fourth disagreed with the statement that mentally ill persons are not capable of true friendships. Twenty-seven percent agreed that mentally ill persons can work. Only 17% thought that one can always tell a mentally ill person by his or her physical appearance. The study also identified the magnitude of the stigma attached to mental illness. 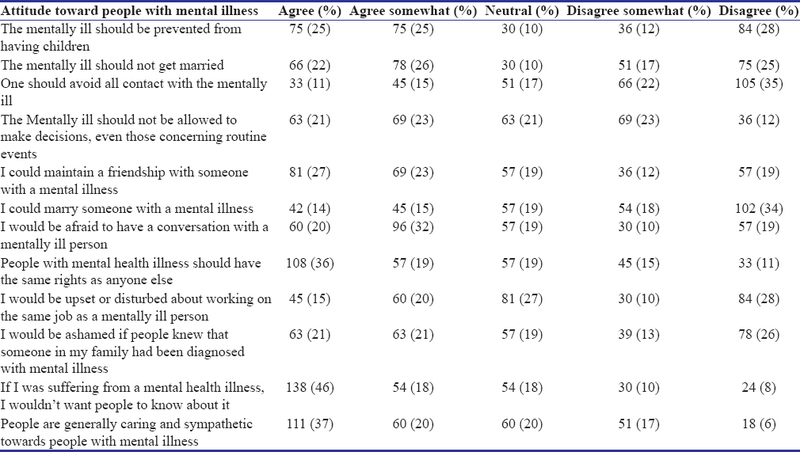 As shown in [Table 4], almost half (46%) of the participants said they would not want people to know about it if they were suffering from a mental illness and 33% believed that one should avoid all contact with the mentally ill. Twenty-one percent thought that the mentally ill should not be allowed to make decisions, even those concerning routine events. Twenty-one percent said they would be ashamed if people knew that someone in their family had been diagnosed with mental illness. Twenty-eight percent of them disagreed with the statement that mentally ill persons should be prevented from having children and 25% did not agree that the mentally ill should not get married. One-tenth said they would not marry someone with a mental illness. One-fifth felt afraid to have a conversation with a mentally ill person. A vast majority (36%) agreed that people with mental health illness should have the same rights as anyone else. A few (15%) said they would be upset or disturbed about working on the same job as a mentally ill person. Twenty-seven percent felt positive that they could maintain a friendship with someone with a mental illness. Very few of them (6%) felt that people are not generally caring and sympathetic toward people with mental illness. [Table 5] shows the knowledge of the participants regarding care and management of people with mental illness. Majority of them (43%) disagreed that one should hide his/her mental illness from his/her family. Only 11% was aware of the fact that there were mental health services available in their community. One third said that information about mental illness was available at their PHC. Twenty-nine percent disagreed with the statement that mental illness cannot be cured. Less than one-fifth agreed that the majority of people with mental illness recover. Thirty percent agreed that mentally ill people should be in an institution where they are under supervision and controlled. Thirty-seven percent were of the opinion that mental illness can be treated outside a hospital. Nineteen percent did not agree with the statement that primary health-care clinics can provide good care for mental illness. Twenty-six percent said that if they were concerned about a mental health issue with a member of their family or themselves, they would feel comfortable discussing it with someone at their PHC. This study was carried out in RL Jalappa Hospital and Research Centre, located in Tamaka village, Kolar, Karnataka which provides secondary and tertiary level health care to the rural population of the Kolar district and also to the denizens from the bordering areas of the neighboring states of Andhra Pradesh and Tamil Nadu. The findings from our study show varying attitudes and levels of awareness toward people with mental illness. We found that among the respondents, three-fourth had no previous contact with a mentally ill person. This may reflect a lack of awareness about mental illness or the stigma attached to making contact with a mentally ill person, which needs to be further investigated. However, in a study done by Al-Adawi et al., they found no relationship between attitude toward people with mental illness and personal exposure to people with mental illness. The participants had a fairly good understanding about the causes of mental illness, with most of them pointing to brain disease, substance abuse and genetic inheritance as the major causes, although some of them still gave significance to God's punishment and personal weakness as causative factors. In contrast to these findings, Gureje et al. reported that in their study, most respondents expressed the view that substance misuse (alcohol or drugs, but mainly the latter) could result in mental illness. The next most commonly endorsed cause of mental illness was a belief that it could be due to possession by evil spirits. Confirming a stronger belief in supernatural causation, over 9% thought supernatural causation, over 9% thought mental illness could result from punishment from God, whereas only about 6% thought poverty could cause mental illness. The study population did have a stigmatizing attitude toward the mentally ill persons with regard to marriage, work, their personal rights, and social interaction with them. The public perceptions that people with mental health disorders cannot be employed or maintain their jobs, live independently, or build long-term relationships is widespread.,, In a similar study, done in southern India, most of the patients believed that marriage can treat mental illness and feel ashamed to reveal mental illness of their family members to others. Knowledge about psychiatric illness seems to be a determinant for stigma. Griffiths et al. found that personal stigma was higher among those with lower depression literacy. It has been stated that the ability to recognize mental disorders is a central part of mental health literacy because it is a prerequisite for appropriate help-seeking. A recent systematic review and meta-analysis of public attitudes showed that despite improvements in mental health literacy, public attitudes and desire for social distance have remained stable over time. Other studies have shown that there is a significant relationship between wishing to maintain greater social distance toward those with mental illness and beliefs about their dangerousness., In a Canadian study, they found that in general, the perceived prejudice is higher for employees with mental health problems, compared with those who have diabetes. In a workplace context, they found that only small minorities think that depression or schizophrenia would not be detrimental to an employee's promotion prospects. Regarding treatment and recovery, the attitude was found to be negative in general, with most of them believing that mental illness cannot be cured and that people with mental illness do not recover. In contrast to these findings, in a study done in Nigeria, majority (79%) agreed that most people with mental illness can get well and return to productive lives with treatment. In a study done in Finland, although the majority of respondents believed that people with depression are not responsible for their illness, a majority still believed that they were responsible for their recovery. In a study done by Penn et al., 81.1% believe that most people would pass over the job application of a former mental patient in favor of another applicant. The attitude toward hiding one's mental illness from family and society was mixed, with one third saying they would be willing to discuss it with someone at their PHC, whereas almost 50% said that if they were suffering from a mental health illness, they would not want anyone to know about it. In a study done in Ireland, 6 out of 10 adults would not want people knowing about it if they themselves were experiencing mental health problems and a similar proportion did not believe that people with mental health problems should do important jobs such as being a doctor or a nurse. Regarding the fact that that mental illness can be treated outside a hospital and that primary health care clinics can provide good care for mental illness, the participants in our study gave a positive response. The knowledge about the availability of mental health services in their community remained poor. The present study concludes that the understanding of the nature of mental illness, its implications for social integration and management remains poor among the general public. Hence, the need for well-coordinated public education, mental health awareness programs and increased accessibility of effective mental health services at primary health centers through training, support, and supervision. Arkar H, Eker D. Effect of psychiatric labels on attitudes toward mental illness in a Turkish sample. Int J Soc Psychiatry 1994;40:205-13. Stuart H, Arboleda-Flórez J. Community attitudes toward people with schizophrenia. Can J Psychiatry 2001;46:245-52. Bhugra D, Leff J. Attitude towards mental illness. Principles of Social Psychiatry. 2nd ed. London: Blackwell Scientific Publication; 1993. p. 385-99. Jorm AF. Mental health literacy. Public knowledge and beliefs about mental disorders. Br J Psychiatry 2000;177:396-401. Das S, Phookun HR. Knowledge, attitude, perception and belief (K.A.P.B) of patients' relatives towards mental illness: Association with clinical and sociodemographic characteristics. Delhi Psychiatry J 2013;16:98-109. Lawrie SM. Stigmatisation of psychiatric disorder. Psychiatric Bull 1999;23:129-31. Charles H, Manoranjitham SD, Jacob KS. Stigma and explanatory models among people with schizophrenia and their relatives in Vellore, South India. Int J Soc Psychiatry 2007;53:325-32. Crisp AH, Gelder MG, Rix S, Meltzer HI, Rowlands OJ. Stigmatisation of people with mental illnesses. Br J Psychiatry 2000;177:4-7. Lai YM, Hong CP, Chee CY. Stigma of mental illness. Singapore Med J 2001;42:111-4. Lee S, Lee MT, Chiu MY, Kleinman A. Experience of social stigma by people with schizophrenia in Hong Kong. Br J Psychiatry 2005;186:153-7. Corrigan PW. Mental health stigma as social attribution: Implications for research methods and attitude change. Clin Psychol Sci Pract 2000;7:48-67. Jack OI, Azebri BP, Ongutubor KE, Amiegheme FE. Secondary school students awareness and attitudes towards mental health disorders in Bayelsa state, Nigeria. Ann Behav Sci 2016;2:22. Fearn A, Goodman K, Wyllie A. Youth knowledge and attitude to mental health and mental illness. Phoenix Res 2006;9:1-60. Al-Adawi S, Dorvlo AS, Al-Ismaily SS, Al-Ghafry DA, Al-Noobi BZ, Al-Salmi A, et al. Perception of and attitude towards mental illness in Oman. Int J Soc Psychiatry 2002;48:305-17. Gureje O, Lasebikan VO, Ephraim-Oluwanuga O, Olley BO, Kola L. Community study of knowledge of and attitude to mental illness in Nigeria. Br J Psychiatry 2005;186:436-41. Kennedy V, Belgamwar RB. Impact of work experience placements on school students' towards attitude mental illness. Psychiatr Bull (2014) 2014;38:159-63. Cook JA. Employment barriers for persons with psychiatric disabilities: Update of a report for the president's commission. Psychiatr Serv 2006;57:1391-405. Corrigan P. How stigma interferes with mental health care. Am Psychol 2004;59:614-25. Ganesh K. Knowledge and attitude of mental illness among general public of Southern India. Natl J Community Med 2011;2:175-8. Griffiths KM, Christensen H, Jorm AF. Predictors of depression stigma. BMC Psychiatry 2008;8:25. Schomerus G, Schwahn C, Holzinger A, Corrigan PW, Grabe HJ, Carta MG, et al. Evolution of public attitudes about mental illness: A systematic review and meta-analysis. Acta Psychiatr Scand 2012;125:440-52. Angermeyer MC, Matschinger H, Corrigan PW. Familiarity with mental illness and social distance from people with schizophrenia and major depression: Testing a model using data from a representative population survey. Schizophr Res 2004;69:175-82. Dean L, Phillips M. British Social Attitudes to mental health problems and mental well being. Natl Centre Soc Res 2015;29:1-15. Aromaa A. Attitudes towards people with mental disorders in a general population in Finland. National Institute for Health and Welfare (THL-Research) 2011;69:1-86. Penn DL, Kommana S, Mansfield M, Link BG. Dispelling the stigma of schizophrenia: II. The impact of information on dangerousness. Schizophr Bull 1999;25:437-46. Brown M, Chambers D. Mental Health in Ireland: Awareness and Attitudes. Dublin: Health Service Executive; 2007. p. 1-37.